The story tells the story from the vantage point of the "creature" from the film, The Creature from the Black Lagoon. The creature has been around for millions of years and presents himself with a sense of disillusion and boredom. He shares his experiences living in the lagoon, left to his own devices and observing life around him. However, several people arrive and begin taking measurements and documenting the area. Some of them leave, but others stay behind and the creature continues to learn about them. Eventually, the creature approaches those left behind and the interaction leaves the men dead. New people arrive including a female that the creature grows increasingly curious and fascinated by. His repeated attempts to grab her attention or capture her result in a confrontation that leaves him mortally wounded and in his last thoughts, essentially accepting that he was indeed deserving of the death he found. 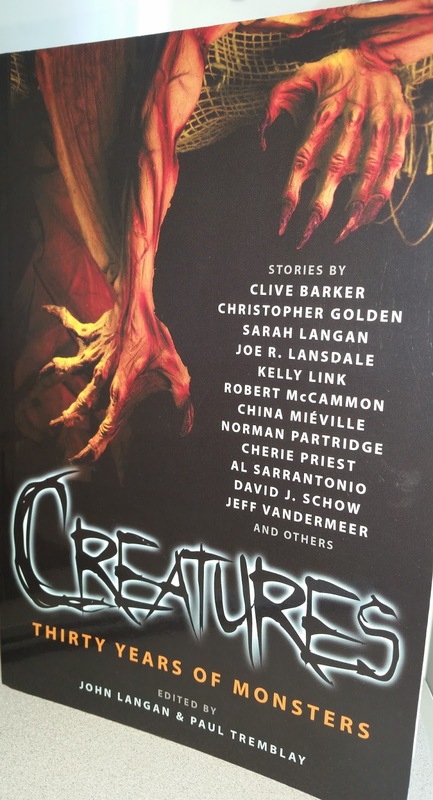 I wasn't enthralled with this story as it felt like a poor attempt at Grendel by John Gardner. It had its moments and I did appreciate the creature's internal revelation at the end as it descended to its death. But a story based upon a film that wasn't that great (in my opinion) to begin with meant the story didn't really shine for me.